Your Hampton Roads-based business is your livelihood, and nothing is more important than keeping it open, functioning and profitable. 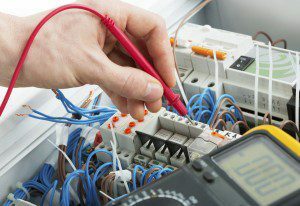 When you experience electrical outages or malfunctioning equipment due to faulty or outdated wiring, you could lose time and money. One call to Norfolk Air Heating, Cooling, Plumbing & Electrical can solve your problems easily while you mind your business. We specialize in all commercial electrical services for offices, restaurants, retail, and other facilities in Norfolk, Virginia Beach and Chesapeake. Need assistance with wiring a new phone or security system? Do you require repair or installation to office or outdoor lighting? Are you adding new offices and need to expand your circuitry to accommodate more computers and manpower? Our experienced and professional commercial electricians will ensure that your Hampton Roads business is well-lit and running efficiently. Let Norfolk Air power your display lights, alarm systems and cash registers, leaving you free to worry about what really matters – business! For years we’ve considered ourselves the Heating, Cooling and Plumbing professionals of Hampton Roads. Now we’re adding “Commercial Electrician” to our resume, as Norfolk Air is now fully licensed and ready to install or repair your commercial electrical system! Call us at 757-963-8365 or Contact Norfolk Air today for a free estimate to install or repair the electricity for your Norfolk, Virginia Beach or Chesapeake business.